The surly octopus that lives between SpongeBob SquarePants and Patrick is one of the less likable characters on the show, but is a wealth of valuable life lessons for young viewers. There are so many things that children can learn from watching Squidward; here are ten of the most important. Vanity is No Fun – As an avid patron of the arts and a creator himself, Squidward is the main focus of all his creations. Using himself as a subject so often has certainly not gained him any fans; artistic success consistently eludes him. Kids can learn a valuable lesson about the negative power of vanity from observing Squidward’s behavior. 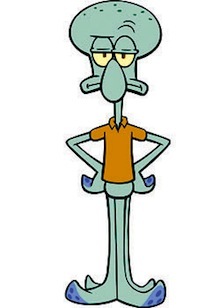 Feelings of Superiority Often Lead to Loneliness – Because he finds himself more cultured and intelligent than the rest of Bikini Bottom’s inhabitants, Squidward often also finds himself without friends. Pretentious Behavior Doesn’t Equal Talent – Despite being a snob when it comes to art, Squidward’s own offerings are universally panned. His pretentiousness and overly-critical observations don’t equate to talent, which is a great lesson for youngsters. Jealousy Can Make You Miserable – Squidward’s fondest desire is to achieve artistic success; upon discovering that SpongeBob’s talent is far superior to his own, Squidward’s resulting jealousy tears at him. Watching his misery that results from being so jealous is a great way for kids to learn that these kinds of feelings only hurt the person who has them. Never Give Up On Your Dreams – Though he may not be a likable character, Squidward is definitely a study in persistence. Even after years of unsuccessful attempts to “make it” in the art world, he refuses to give up on his dreams. Be Careful What You Wish For – Upon moving to a town filled with like-minded inhabitants, Squidward discovers that living with those who share his artistic tastes and perspective on life isn’t all he hoped it would be. This can be a great lesson for kids about the “Grass is Greener” syndrome. A Bad Attitude Can Test Anyone’s Patience – Even good-natured SpongeBob lost his temper with Squidward in the episode “Fools in April.” Watching Squidward as he found himself on the receiving end of a rare outburst from SpongeBob teaches kids that even the most patient people can lose their temper when faced with a person who makes unreasonable demands. Sabotaging Your Friends is Just Not Nice – Squidward often resorts to tricks and even outright lies in order to sabotage SpongeBob, who erroneously thinks of Squidward as a friend. Seeing SpongeBob suffering as a result of Squidward’s nefarious actions can teach kids that plotting against their peers is hurtful and wrong. Don’t Judge Things You’re Not Informed About – Even though he’s worked at the Krusty Krab for quite some time, Squidward’s inherent snobbiness led him to decide that the Krabby Patty is unappetizing, despite never having tried it. Upon his first bite, he discovers that he loves them and learns that judging things you’re ignorant about isn’t wise. Cruel Plans Can Backfire – Much of Squidward’s plotting against SpongeBob leads to plans that backfire, with Squidward bearing the brunt of the consequences. Seeing these situations unfold can help kids understand that sinister plots rarely work out as planned. Sometimes the lessons of who not to imitate are the easiest ones for kids to pick up on. That is probably true with Squidward.